Seoul, Korea - Oct 9th, 2013 - LG Chem, a leading battery manufacturer, is ready to unveil batteries that have not existed before. The company announced on the 8th that it has succeeded in breaking the tradition of rectangular shaped batteries to lead the effort to a more sustainable future by mass producing batteries of different shapes. The types of LG Chem’s future batteries can be categorized as the following. ▲ Stepped Battery, ▲ Curved Battery and ▲ Cable Battery. At the moment, the chemical company is already mass producing stepped and curved batteries. 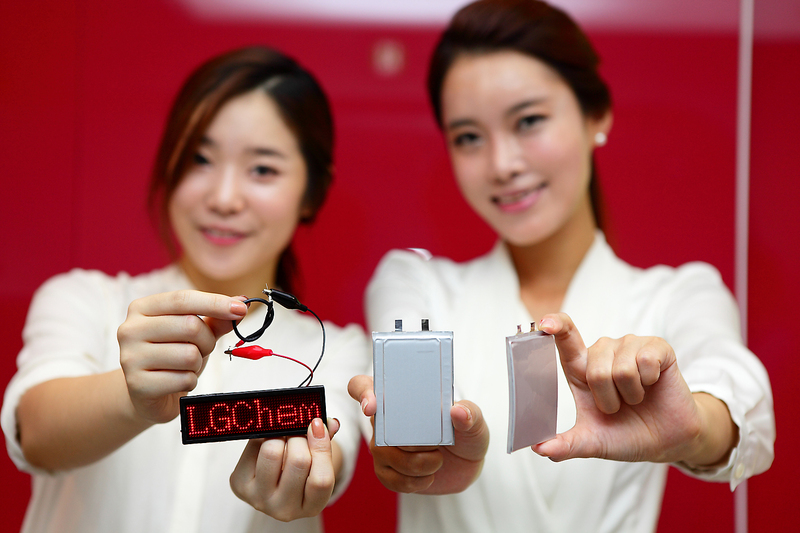 Stepped Battery from Nanjing plant of LG Chem has been manufactured since July to power LG G2. However, the actual production of Cable Battery shall begin in upcoming years. First of all, Stepped Battery refers to an integral type of a battery in which two batteries are added on top of each other in the shape of "step design." The battery takes greater advantage of available space within the device than other batteries as it perfectly suits the changing trend of modern IT gadgets of flexible designs. For example, recent mobile devices have been adopting round shapes and designs with rear buttons creating unnecessary "dead space" inside the gadget. With Stepped Batteries, the dead space can be filled up to fully power the handset and also increase the battery capacity. In fact, the battery density has increased the capacity by 16% and also the life span by more than 3 hours when applied to the newly launched LG G2, a premium smart phone by LG Electronics. The competitors in the market may succeed in stacking two batteries to make it into the step design but due to the increased cost of such technology, rivals will not achieve to do so, unless they can make it to an integral single type just like LG Chem. At the Nanjing plant, LG Chem plans to launch Stepped Battery that goes beyond 3 to 4 step designs, stacking up more batteries into one single type depending on customer needs. In addition, LG Chem’s Curved Battery refers to packs that can power IT devices with curved screen or flexible designs such as smart phones, watches and glasses. The company has the exclusive patent of Stack & Folding technology which reduces physical stress when realizing the curved design of battery packs. The mass production of Curved Battery has been started since this month and the products will power the next smart phone line up of LG Electronics. ed into a knot. Because it has been designed to use low electricity, the battery does not heat up although the user may operate the device for a long time. Moreover, the waterproof features of the battery allow itself to be used in wearable gadgets regardless of flexible figures, from necklace types to smart watches. “Through our proprietary technology, LG Chem has succeeded in launching future batteries that have not existed before. This shall be the fundamental grounds for LG Chem to become a pioneer in the market. As a leader of battery manufacturer, we will continue to strive for Global No.1 by developing more of optimized, safe and long-lasting batteries to make it the business of future generation”, said YS Kwon, the President of Energy Solution Company, LG Chem. 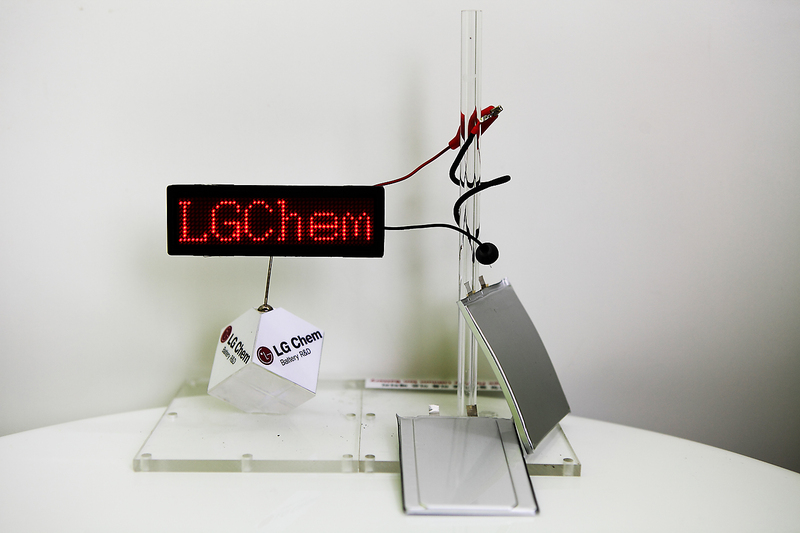 LG Chem will be displaying and demonstrating its latest technologies at InterBattery 2013, taking place at the COEX Convention & Exhibition Center in Seoul starting on October 16.